You can finally have your picnic and sail it too. The new Hinckley Sou’wester 53 carbon epoxy sailing yacht is the first to deliver modern, family sailing with a beautiful inside-out layout so you can enjoy it all together. 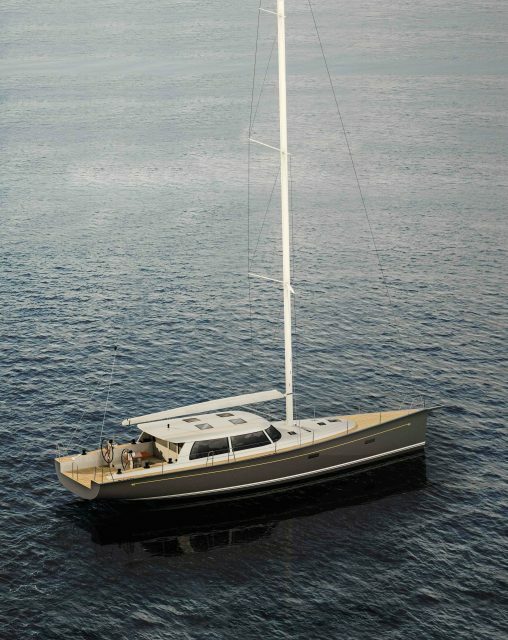 Experience the pure joys of bluewater sailing once again with an ease of ownership that is uniquely Hinckley. 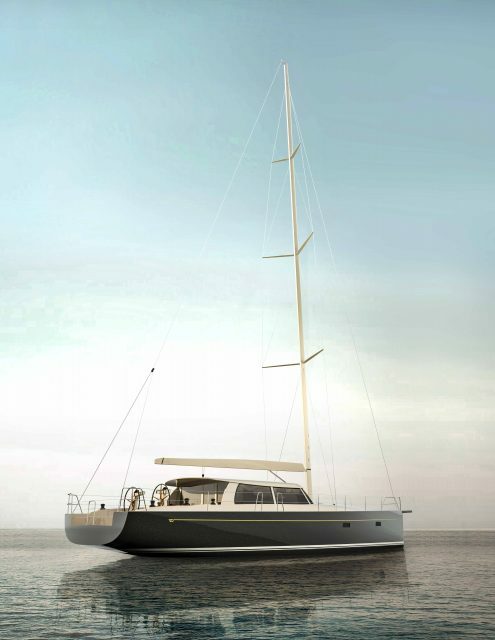 Designed by Tripp Design Naval Architecture, the Sou’wester 53 is more than just a social experience with friends and family on a lively, modern yacht. 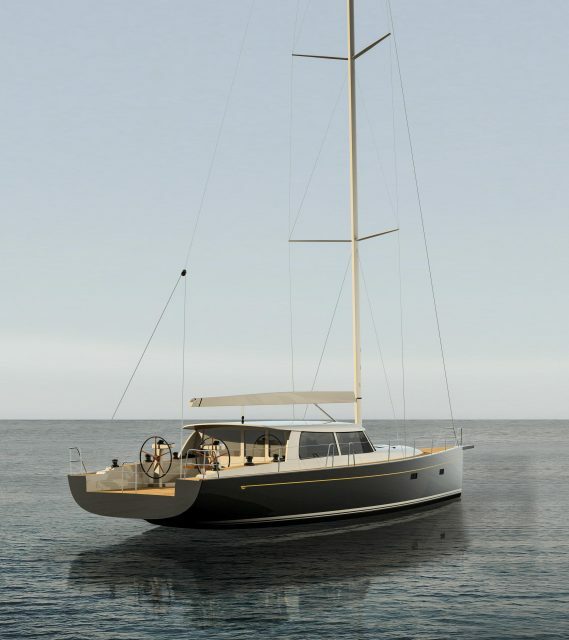 It is also about reconnecting with the pure joys of sailing which have been somewhat lost on today’s widebody catamarans. When the sun is shining and weather is favorable, the helmsman can leave the protected pilothouse for the stern helm station and feel the wind in her hair as she focuses on keeping the telltales flying just right, regaining that tactile connection with the rudder and with the wind. The station is raised for full views over the pilothouse and a complete view of the sail plan. The ability to choose helm stations as the weather changes makes a world of difference. 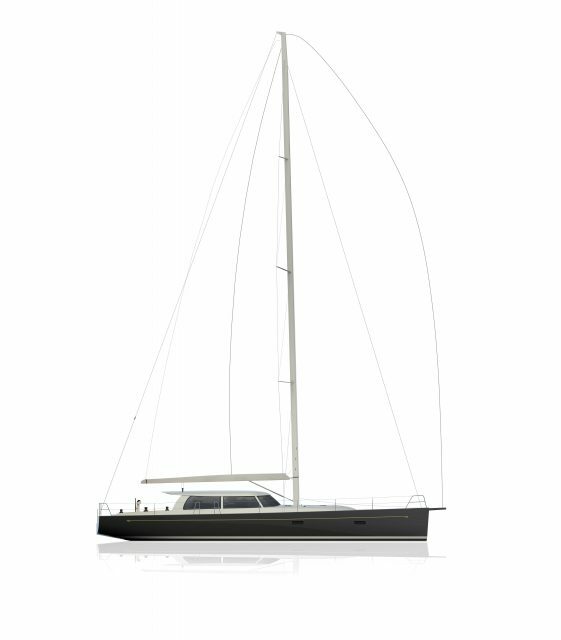 After nearly 25 years of building Picnic Boats and Talaria Motor Yachts designed to maximize entertainment space with utility, the Sou-wester 53 brings this inside-out entertainment focus to our timeless sailing yachts. 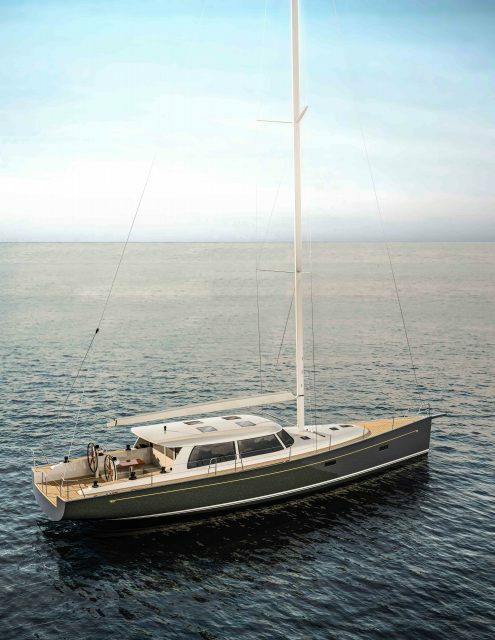 The Sou’wester 53 underbody features a modern performance hull with the latest in keel stem and bulb shape. Her draft of 8 feet 3 inches will provide for lively performance while enabling visits to harbors and coves where yachts of similar performance could not ordinarily venture. At Hinckley, we have always believed in embracing new technology and shaping it with time honored construction methods. 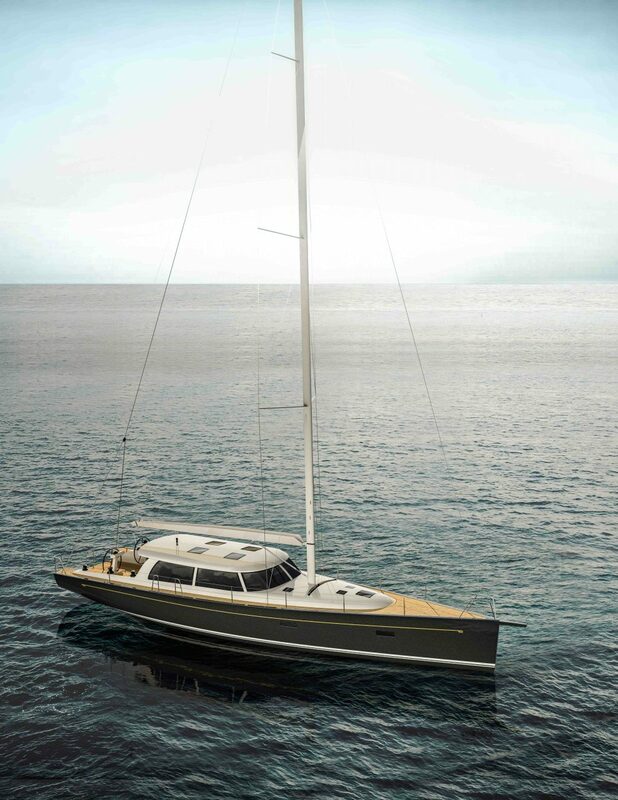 The result of all this focus on advanced composite materials and dry-laid single bond epoxy infusion is a yacht of tremendous strength, seaworthiness and beauty. Weight savings in the hull structure allow for the signature teak woodworking accents which are Hinckley hallmarks. The innovations in hull materials allow us to provide the luxury on deck and below deck which our owners and their families love. The Sou’wester 53 offers many comforts, but there are a few in particular you will rarely find on other yachts – the comfort of longevity, enduring quality and timeless beauty. *Visit Guarantee to learn more. Any discussion regarding accommodations begins with the pilothouse, the central design feature around which all other aspects of the yacht revolve. The pilothouse offers standing headroom and sweeping 360-degree views. A plush settee to port, upholstered to the owner specifications, is the perfect spot for family and friends to gather, to read a good book, or to entertain guests. Our trademark teak and holly sole is tirelessly varnished and polished for durability and stunning appearance. To starboard inside the pilothouse is the galley. This modern design brings the galley up into the pilothouse and ensures it regains its rightful place as the gathering point of friendly conversation. Also to starboard in front of the galley is the interior helm station. This new helm station completely changes the sailing experience. As the weather turns, the helmsman simply moves foreword to join the social gathering and is shielded from the elements. The result is far more bluewater sailing miles combined with requests from family and friends to return again and again. As on every Hinckley, the brightwork is extraordinary. The time we spend on fit and finish is rivaled only by the time over the years many will spend admiring it. Before any wood pieces are joined, they are carefully selected for matching grains, often derived from the same tree. This is a painstaking endeavor which yields a level of finish unmatched in yacht building. Our wood elements are shaped into elegant curves and frequently cored with lightweight foam so that the beautiful wood actually feels as light as air. A Hinckley interior is crafted to last for decades. Two steps down to port from the pilothouse is a comfortable guest or captain cabin tucked neatly away. Moving forward to port past the settee and down two steps is the guest stateroom queen size berth and hanging lockers. The separate head with shower is located across the passageway. In front, the owner’s stateroom showcases a plush queen size berth fully forward with en-suite head and separate shower and lockers of various sizes to hold everything from sailing gear to books and personal items.